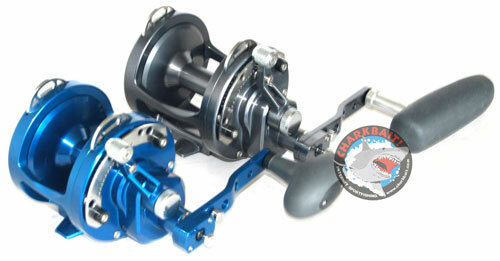 We've received the new 3 Speed Raptor HX and HXW reels from Avet this past week. Most colors now in stock in both sizes. Nicely done, well planned gear ratios at 5.4, 2.4 and 1.3 to 1. You'd remarked that the earlier 3-speed required the user to change gears one at a time. I assume that's still the case with the new reels? AFAIK these are unique. Fin-Nor made a huge 3-speed decades ago, and no one else did until Avet. I've never seen one in use, and have no idea how useful that third gear really is. Initial prototype of the larger big game reels seemed vague in shifting. That improved upon full production. The mechanism takes some getting used to, once done it's more predictable in performance. We've sold quite a few of the 50 size, have heard no negatives from those fishing 'em, and the granny gear and mid gear make good sense as does a faster high gear for winding a jig. They aren't for everyone, for sure, and their benefits will be greatest for those seeking the advantages of more gear choices given their fishing application. I used the Avet 50 3 speed last year and landed a 209 lb. YFT with it on a Seeker WDS 4x 7'3". The reel worked flawlessly, I had a couple chances to gain line and went to high gear, when the fish turned and ran I simply down shifted, cranking when I could gain line. The best part of all was hitting low gear to gain line on those small circles when the fish is finished running and you are looking for a couple inches every time his head is coming at the boat on the circle. Great reel! I'm looking forward to the 3 speed HX for BFT this season and think Avet has a piece of equipment that will prove effective and versatile.